Men’s Cross Country Races Into Season | The Gettysburgian. First year Jack Kenyon and Peter McQuade along with junior Thad Cwiklinski formed a solid pack in Friday’s invitational. 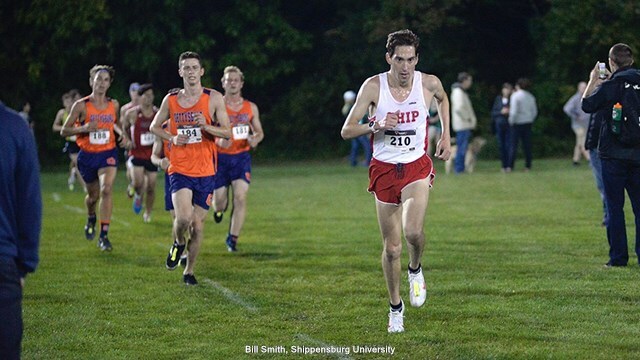 The Gettysburg College Men’s Cross Country team officially started its 2017 season under the lights at the Galen Piper Invitational at Shippensburg University on Friday night. The invitational was a competition between division II and division III colleges including Shippensburg University, Elizabethtown College, Dickinson College, York College, Frostburg State University, Hagerstown Community College, Pennsylvania State University – Mount Alto and Shippensburg alumni. With 144 points, Gettysburg finished fifth of the seven in the competition. First year Nick Rose of Meadville, Pennsylvania made his debut as a Bullet during the invitational, finishing 74th in a field of 108 runners, and 12th for the 19-man team, respectively. “I felt a sense of amazement, I’m actually running in college and I wanted to do my best to win,” said Rose. The men ran a six-kilometer race Friday — one-kilometer longer than the typical high school race to which Rose was accustomed. “I’m optimistic overall and looking forward to the progression of the season,” said Rose. The men will continue to increase their distance as the season progresses. The official length of the Centennial Conference meet is eight-kilometers. Rose clocked a 22:15 for his first meet as a Bullet. Crossing the line at 20:03, junior co-captain Alex Petrecca posted the best time of the Bullet runners. Petrecca finished 15th in the meet and 10th for collegiate athletes. With Ben Taber graduated, Petrecca is expected to be a consistent top finisher for the men’s squad. A three-season runner, the Fairfield county junior has had impressive performances in the 800, 1500 and 5k on the track, while leaving his mark on the cross country season with a 191st out of 351 runner finish at last season’s Division III Mid-East Regional meet. Other notable placements from the men’s cross country team were sophomore Samuel Sheldon’s 23rd place finish at 20:19, and junior Matthew Robinson’s 20:46 6k, worthy of 36th place. It is Sheldon’s first season on the cross-country team. Sheldon did not run cross-country in high school but has been a consistent track runner since his first year of high school. He runs the 200, 400, 800 and 1500-meter races for the track and field team. The Bullets enter the season with much young talent in tow. Eight first-years and two sophomores constituted the running squad Friday night. The new team additions allow for much pack running potential this season, which is a technique crucial to any running team’s success. During Friday’s meet, the one through five split for runners for the Bullets, those whose points count towards the team score, was 53 seconds. Junior Mike Miller, who recently returned to running from a stress facture that set him back in summer training, had a strong finish by coming in fourth for the Bullets and 47th overall. First year Owen Crosby, from Wilmington, Delaware, placed 51st out the 108 participants in a time of 21:04. While an impressive first performance, Crosby refuses to settle. “I’m looking to get better with each race, particularly to reduce my time gap as the year goes on,” said Crosby. The physical act of running was not the only thing that motivated Crosby at the invitational. With four runners in recovery from summer injuries, it is the hope of the team that the full squad will soon be back together and the camaraderie may continue. The Bullets return to the starting line this Friday, September 8, at 6PM in the 37th annual Little 3 meet at Dickinson College.